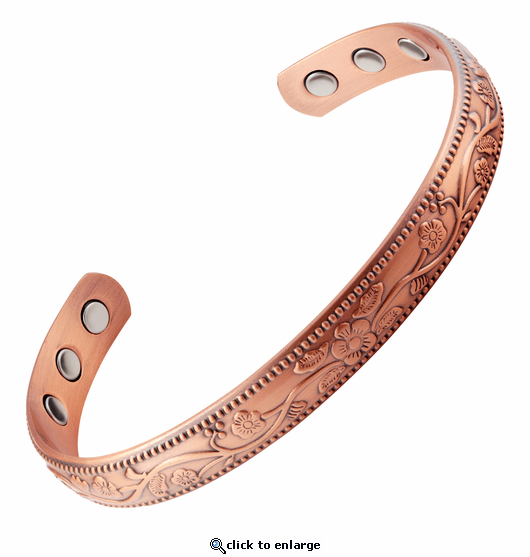 Copper bracelets are a wonderful way you express yourself in a heathful way. This solid copper therapy magnetic bracelet is no exception. Styled in burnished copper with floral splendor. This bracelet has 6 powerful 3000 gauss neodymium rare earth bio north facing magnets and stainless steel magnet caps for added durability. It is made nickel free. This is a unique design and suitable for any occasion. I love them! I don't even know they are on my arm and I wear them to bed also. I've worn hematite magnetic bracelets for 5 years to eliminate painkillers and thought I'd try copper now so I have 2 copper bracelets on one arm and a hematite bracelet on the other. I am a forever customer. My order arrived within a few days. Put the bracelet on immediately and have not take it off since. My coworkers liked it so much that I ordered two more just for them. I loved the personal touch of a hand drawn smiley face on the packing slip! Made the order feel more personal. Thanks! I will definitely be a return customer! I really like the Splendor bracelet. I don't know if it is all in my head or not but it seems to be helping my shoulder pain. This is my first time to wear one and I also like the looks of it too! My late husband swore by the copper for his arthritis...said it worked so I'm hoping it works for me too with the help of the magnets. Love my copper fish ring too. The bracelet is beautiful, I'm giving it a 4 star at this time because it has not started helping me yet, I've only had it on going on 2 weeks. Love the bracelet. It is helping my bursitis! My boy friend bought it for me , It didn't work for me at all. Reply by MJS: Have you read the included instructions? Do you have the correct size and are the magnets resting against your skin? Are you wearing it all the time? If we can help, please let us know. I'm going to rate this piece a 4. It's higher than I would rate in regards to my overall health experience. However, I do love the looks of this bracelet. As far as appearances, it is a 5. As far as how it fits, i would also give it a 5. You were right on, in the description as far as that goes. For functionality, only in my personal experience, I would give it, maybe a 2. I haven't experienced a decrease in my migraines when the barometric pressure drops. I haven't worn it long enough to accurately say whether it lessened the pain. That being said, many treatments I have tried have helped others, but not me. I believe this is definitely worth the try and if it doesn't work, you have a very cute, stylish piece of jewelry! Costs less than most of my migraine treatments I have tried! I still plan to try a necklace to see of that has any affect. better than i expected, wife took it and put it on her ankle...........i had her take it off and re-moulded it to fit my wrist....perfect fit, completely satisfied. I work as a cashier in a busy grocery, and many of my higher seniority co-workers have carpal tunnel syndrome. I'm hoping that copper/magnetic therapy bracelets will curtail it happening to me. This bracelet is beautiful, and I thought the price was very reasonable. It looks just like the picture, and had a very swift delivery time. I am vey happy with this purchase. Absolutely love the bracelet. Besides being pretty it actually works for body discomforts. We bought 3 and they seem to work my hands are less painful the more I wear them. Thanks for making them and they are pretty too. I purchased the Splendor Copper Magnetic Therepy Bracelet. Love it. It is very pretty and you don't even know you have it one, it's that comfortable. This really works for arthritis! I have worn since I received the bracelet - have not taken it off! My pain is gone! Bracelet was beautiful. Had to return it because my friend saw another copper bracelet on the same website and wanted it instead. Very good quality and looks great! Sorry my friend saw another one!